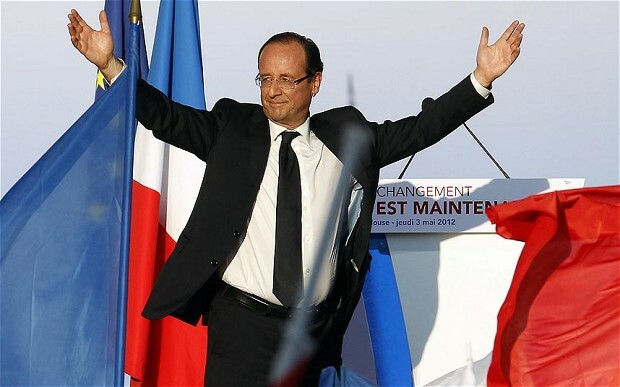 There were jubilant celebrations last night in the centre of Paris, as the socialist candidate François Hollande the Socialist candidate ousted incumbent President Nicolas Sarkozy. He became only the second incumbent in half a century to be booted out of the Elysée Palace. Hollande is the first socialist president in a generation, and for Sarkozy the defeat was perhaps made more humiliating as he became only the second incumbent in half a century o be booted out of the Elysée Palace. Hollande has promised to ‘revive the French dream’. This meant, he said, “fairness to all,” new opportunities for “the young” and “better lives, from one generation to the next”. This is an exciting time not just for France as it enters a new era of domestic politics but for all of us in Europe. Hollande has a packed diary already and towards the end of June, He will attend an EU summit in Brussels in which he will discuss his refusal to accept harsh fiscal medicine to save the euro unless it is accompanied by ambitious, EU-wide investments funded by the European Central Bank. His vision and ambition is clear. Today it is a new dawn in French politics. You can read full coverage here. Greece also had elections over the weekend, and although it received less coverage it’s result will impact across Europe. The exit polls suggested that the main parties would receive a drubbing from the electorate. And for the first time since the collapse of military rule, ultra-nationalists were also set to enter parliament with polls showing the neo-Nazi Chrysi Avgi (Golden Dawn) capturing as much as 8%, The Guardian reported. It was a week of mixed emotions last week. On the one hand I was delighted that the Labour Party did so well in the local elections, and Ed Miliband was right to be cautious, telling supporters that there is still more work to do’. And we must not lose sight of this. Nevertheless it was a good result and we should be encouraged by the result. You can read Patrick Wintour’s reflection on the local elections here. I was, however, very sorry that Ken Livingstone has announced that he is to step out of politics and will not run again following a narrow defeat at last week’s elections. His final speech in City Hall was dignified and it is a great loss to London. Tomorrow’s election for London Mayor will be a close run thing. It is therefore crucial to turn out to vote Labour. We in London deserve a break from Boris Johnson’s moonlighting. We need a mayor who will give the job his full attention. London has had enough of the Tory part-timer’s antics. It’s about time we had a mayor who put our – yours and my – concerns first. I will cut fares by 7% this year and freeze them throughout 2013. Oyster single bus fares will be reduced from £1.35 to £1.20. From 2014 fares will not rise. Boris Johnson has admitted cutting 1,700 police officers. If I am elected, I will reverse his cuts. And I will reinstate sergeants to all 600 Safer Neighbourhood Teams. I will establish an all-London non-profit making lettings agency which, by cutting out Estate Agents’ profit, will help reduce rents and provide secure tenancies. I will enable London households to save over £150 a year on energy bills through taking up money from energy companies for better insulation. After the Tory-led government’s abolition of EMA I am committed to restoring a London-wide Educational Maintenance Allowance of up to £30 per week in term. “I will help families with the upfront cost of childcare through offering grants of up to £700 to low income families and interest-free loans to families earning up to £40,000. Ken’s running mate Valerie Shawcross will make an excellent Deputy Mayor. GLA Member for Lambeth and Southwark and a former Leader of Croydon Council, Val has gained huge experience in London politics. Val and Ken are an outstanding team and fully deserve your vote. It’s not so often that we get a star-studded event in the Labour Party. True to form Ken Livingstone came to the rescue yesterday with a gala dinner to rival all others, not just a a fundraiser, more a gathering of the Labour glitterati. So who was there? Labour Leader Ed Miliband, of course, Richard Wilson aka Victor Meldrew, Ken himself and his running mate in the London Mayoral election, my old friend Val Shawcross, not to mention former Olympics Minister Tessa Jowell. All the Labour GLA Members were also present as was Andrew Dismore who I am supporting to be Labour’s GLA candidate in Camden and Barnet. There were others too. You will see me pictured above with the recently ennobled Roy Kennedy and Labour Party Deputy General Secretary Alicia Kennedy and below with Ken and Nicky Gavron. I was also pleased to catch up with Tribune owner Kevin McGrath. 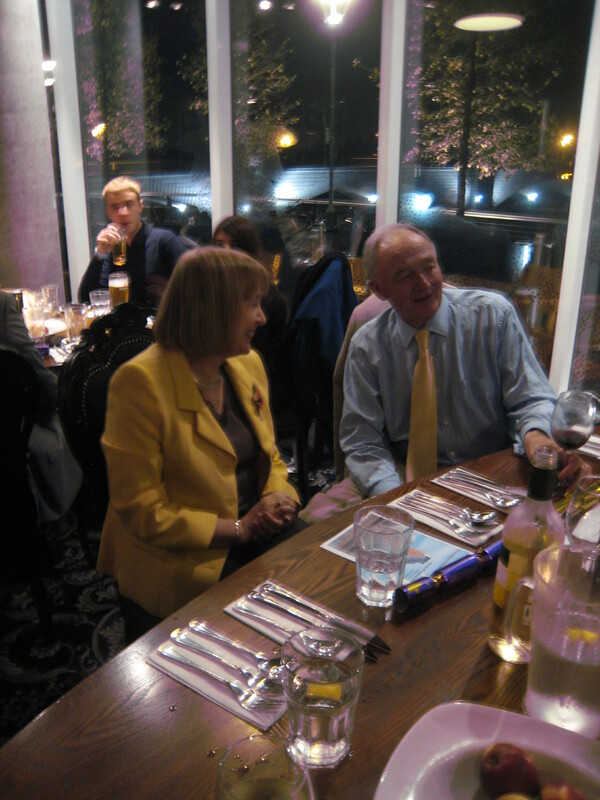 It would be remiss not to mention Ealing MP Stephen Pound who did the auction, raising a considerable sum of money. Stephen is in great demand for his skills as an auctioneer, and was at his best raising money for Ken Livingstone’s for Mayor. The Globe Theatre in Southwark was an excellent venue, radiant as it is with Shakespeare and Elizabethan memorabilia, a fitting place indeed for a London event, the event which launched Labour’s campaign to return a Labour Mayor in our great city. My thanks as ever to all those who organised the event and made it such a great evening. 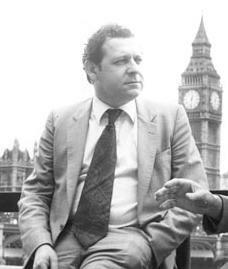 It is with some trepidation that I write about Andrew McIntosh, Labour peer and member of the Greater London Council, who died at the end of August. He achieved much during his time in public life and will, I believe, be remembered as a leading light in London Labour politics. One of his less remembered but important contributions was his work on the 2005 Gambling Act in his capacity as a Minister in the Department for Culture, Media and Sport. John Carr, one of Andrew’s GLC colleagues, writes about this in today’s Guardian. Andrew was, in fact, very successful in this matter. Since the legislation became operative, children’s organisations are not aware of a single instance where a child has managed to evade the system. I first met Andrew when I worked at County Hall in the late 1970s. I remember him as a friendly and approachable GLC Member, even though at the time we were in different Labour Party camps. 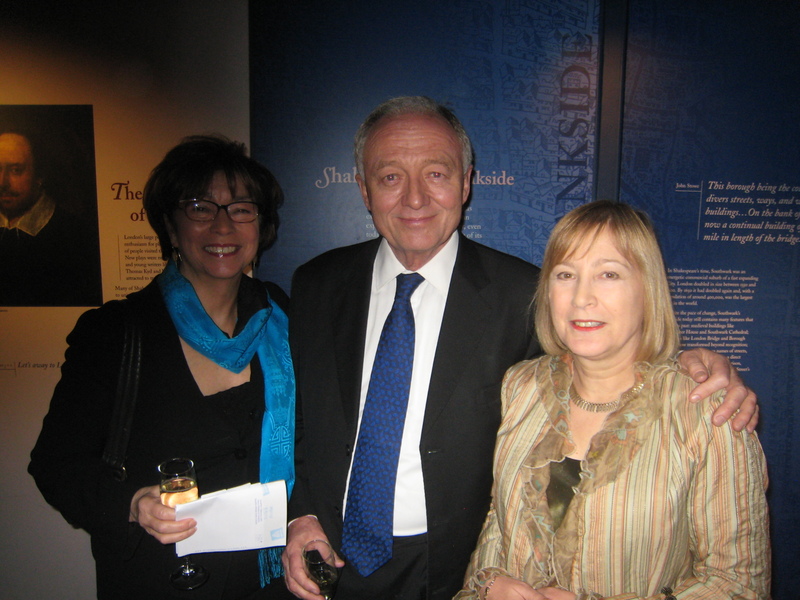 Then, as now, I was on the side of Ken Livingstone and supported Ken on the London Labour Party Executive where I was a member for much of the 1980s. 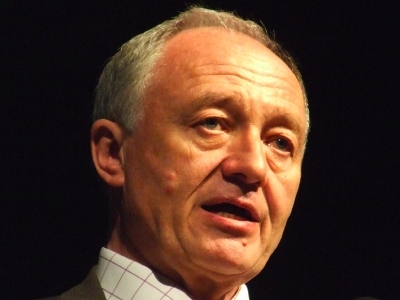 After Ken Livingstone became Leader of the Greater London in 1981, Andrew went on to serve in the House of Lords for nearly 30 years. He was Labour frontbench spokesperson variously on education, industry and the environment, rising to be deputy leader of the opposition in the Lords (1992-97). After 1997 Andrew became deputy chief whip in the Lords, speaking for those many departments with no Lords minister of their own until, in 2005, he gained ministerial office in the DCMS. 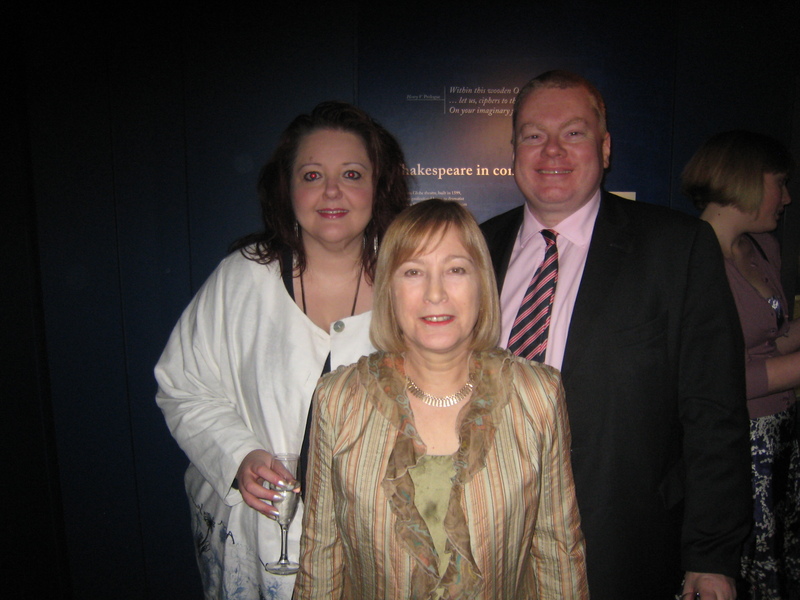 Of particular interest to me as an MEP is the fact that Andrew was a member of the Council of Europe parliamentary assembly from 2005 and chair of its education and media subcommittee from 2008 until his death. He was very well regarded, a formidable chair, and in January 2007 the Council appointed him its rapporteur on media freedom. He also worked to advance the Bologna Process, designed to ease the movement of university students and staff around Europe, something I deal with in my role on the European Parliament Culture and Education Committee. He was, in addition, an honorary associate of the National Secular Society, a distinguished supporter of the British Humanist Association and a vice-chair of the all-party parliamentary humanist group. Ballot papers to select Labour’s candidate for London Mayor will be dispatched next week. Ken or Oona: our previous, successful Mayor or the lively, personable former MP? It’s a hard choice, but one Labour Party members have to make. I have come to my decision. It quite simply has to be Ken. As a feminist and a longstanding campaigner for more women in public life, I would dearly like to support a female candidate, this would be my natural choice and what people would expect me to do. 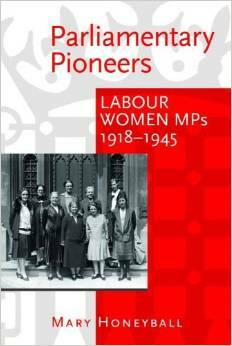 I find it a real shame that there is no woman standing as Labour Mayoral candidate who has the right experience. However, I have decided to support Ken as he is the candidate with a proven track record in running London with the ability to deliver in the future. I first came across Ken Livingstone in the 1970s when he was a new Member of the GLC and I was an employee. I later worked on the campaign to save the GLC from abolition by Margaret Thatcher. During the last 10 years as a Labour MEP I have, of course, had dealings with the Labour Mayor of London. I did not always find it easy dealing with City Hall when Ken was in charge. Since his staff were not from the same political wing of the Labour Party as me, co-operation was not always forthcoming and I was, on occasion, obviously omitted from women’s events where I, as Labour Spokesperson on Women’s Rights in the European Parliament, would have been an obvious choice. It must be said, both Ken and Oona are experienced politicians who both have considerable experience of political campaigns. However, the selection we as members make must be based on the person who has the highest level of experience, who can deliver for Londoners and who will be the strongest opponent that Boris can face. That candidate is Ken Livingstone. Livingstone had a truly daunting task as the first elected Mayor of London and he rose to the challenge. When he left office he left many accolades: the congestion charge, the opening up of Trafalgar Square, the improvements at Vauxhall Cross, the London low emission zone – the list goes on. As the one-time Leader of the Greater London Council who introduced “Fares Fair” on the Underground, Ken understood how to get things done. Ken has done it once and will do it again. Although he is the candidate better suited to run London this by no means detracts from Oona King. Oona is intelligent and hardworking, and she was an excellent MP for Bethnal Green and Bow. I remember canvassing with her during the 2005 general election campaign when her popularity was evident and her knowledge of her constituents second to none. I would like to see Oona back in the House of Commons where I am sure she would carve out a successful career. Politically I am closer to Oona King than left- wing ‘Red Ken’. But I believe it would be a mistake to elect the Mayoral candidate on the basis of political philosophy alone. Too often in the Labour Party we choose our representatives and leaders for what they say rather than what they can actually do. As a London representative, I understand that what a challenge running London is and how important it is to deliver for the people of our city. I am aware that Ken is not perfect. He is, however, our only realistic choice. Just to say I am due to be interviewed by Ken Livingstone on his programme on LBC this morning. Ken will talk to me about the petition calling for the Metropolitan Police to keep their specialist unit dedicated to combatting human trafficking which I presented to the Metropolitan Police Authority on Thursday. It is good that Ken has picked up on the trafficking issue and realised just how important it is. This kind of publicity very much helps to raise the profile of the campaign to end this vile trade in vulnerable people.